(Tay Ninh Holy See March 24, 2019 - News and photos: Caodai TV) At 7:30 am on March 24, 2019 (19/2 Ky Hoi), the ARTE TV Filming crew came to Tay Ninh Holy See to film an introduction to the Cao Dai religion for its program "Discovery, Culture and Tourism in the World ”. It is known that TV station ARTE (short for Association Relative à la Télévision Européenne) is a TV station linking France and Germany, broadcast in France, Germany and Europe (Belgium, Austria, Luxembourg, Finland, Switzerland, Netherlands, Italy,) in 6 different languages: English, French, German, Spanish, Polish and Italian. (News from the Cao Dai Holy See in Tay Ninh on February 13, 2019 - Photos by Huu Loi, Le Cuong and Caodai TV group) The program for the Great Festival Commemorating God in the Year of the Pig (2019) was as follows: February 12, 201 9 + 08:00am: - Grand Opening Ceremony of the Great Festival on the front plaza of the Holy Temple. Cardinal THUONG TAM THANH, Chairman of the Sacerdotal Council of Caodaism delivered the opening speech, and presided over the ribbon-cutting ceremony. The Cardinal then took the guests for an inspection tour of the 31 exhibition booths. + 05:00pm: - Arrival of guests at the Pope’s residence. Vegetarian dinner in the Auditorium. + 06:30pm: - After the vegetarian banquet at the auditorium, Cardinal Thuong Tam Thanh led the guests to the grandstand in front of the Holy Temple to watch the Parade. 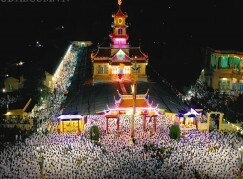 According to the Cao Dai Sacerdotal program, at 7:00 am, on the 1 st day of the Lunar New Year (ie. February 5, 2019), Cardinal Thuong Tam Thanh, Chairman of the Cao Dai Sacerdotal Council at the Holy See in Tay Ninh, and a number of dignitaries and religious officials of the 9 Ministries, as well as thousand of Cao Dai followers, gathered in front of the Holy Great Temple to watch the start of the Lunar New Year celebration, which included dance of dragons and music performance. It is estimated that more than 50 thousand followers attended the ceremony. 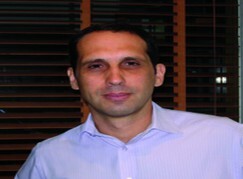 Born in 1974 - French National - Married - 1 Child Current position 2014-present Associate Professor - Universiti Brunei Darussalam Institute of Asian Studies (www.ias.ubd.edu.bn) Associate Researcher Institute of Asian Studies (IAS, Universiti Brunei Darussalam) since 2014. Studies Centre of East Asia [Centre d’étude de l’Asie de l’Est] (CETASE, Université de Montréal) since 2013. Southeast Asia Center [Centre Asie du Sud-Est] (CASE, CNRS, Paris), since 2012. Research Institute on Contemporary Southeast Asia (IRASEC, CNRS-MAEE, Bangkok), since 2010. Societies Religions Secularisms Group [Groupe Sociétés Religions Laïcités] (EPHE-CNRS, Paris) since 2009. (Saigon November 29, 2018 – Written by An Tu and Nhon Quang – Photos by Huu loi, Phu Vinh and Van Hoang) The Cao Dai youth at the Cao Dai Saigon Congregation in HCM City has received an invitation from the Organizing Committee of "Vietnamse Traditional Music Instruments Performing Competition and International Folk Music Festival" to participate and show its performances at the Conservatory Music of Ho Chi Minh City, Nguyen Du street, District 1, Ho Chi Minh City on the 27 and 29 November 2018. (Dec.6, 2018 – Photos taken by Le Cuong - Caodai TV) At 10 am on December 6, 2018, Hollywood movie star MORGAN FREEMAN visited the Cao Dai Tay Ninh Holy See. He was warmly welcomed by the Supreme Patriarch Cardinal Thuong Tam Thanh, Chairman of the Cao Dai Sacerdotal Council, at the Cardinal’s office. The delegation of Mr. Freeman is comprised of 23 people, 16 of whom are from the United States (including Production Manager, Screenplay Manager, Cameramen, Sound Specialist, Makeup Artist, and many other assistants) and seven Vietnamese specialists from the "116 Company"
(Reported by Nguyen Tuan Em, CaodaiTV – Edited by Joe Hobbs – Sep. 30, 2018) The 2018 Grand Festival Commemorating the Holy Mother Goddess (in Vietnamese Hội Yến Diêu Trì Cung) was held on the 15th and 16th of the lunar month of August 2018 (24th and 25th of September in the Gregorian calendar). Hosted by the Sacerdotal Council of the Cao Dai Tay Ninh Holy See, this successful celebration attracted more than 250,000 pilgrims and tourists from all over Vietnam and many countries abroad. A major component of the Mother Goddess Festival is the “Grand Banquet” (Hội Yến Diêu Trì) in the Diêu Trì Palace (Diêu Trì Cung), hosted by the Holy Mother Goddess herself. (Reported from Bangkok, 10-13 March, 2018 by Caodai TV – Photography by Tuan Em and Huu Loi) The two-day 2 nd International Conference on “Inter-religious Relations for Sustainable World Peace” was jointly held at the Institute for Population and Social Research, Mahidol University, Salaya, Nakorn Pathom, Thailand by Universal Love and Brotherhood Association Thailand (ULBA Thailand) and Japanese Oomoto’s Universal Love and Botherhood Association from 10 March 2018 to 13 March 2018. (From Columbia, Missouri, 5th November, 2017 – Reported by Nguyen Tan Khoa – Translated into English by Nguyen Tuan Em) Reverend Thuong Canh Thanh (his secular name’s Tran Quang Canh), President of Cao Dai Overseas Missionary, accompanied by a Caodai Follower Nguyen Tan Khoa from New Orleans, Louisiana, visited the University of Missouri in Columbia City in the State of Missouri to make presentation on Cao Dai Religion to students of the Department of Religious Studies from November 1 st , 2017 to November 3 rd , 2017. 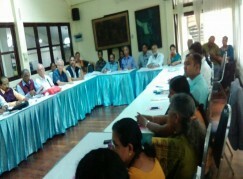 (Bangkok September 5 th , 2017 – Reported by Mohammad Jahangir Alam) United Religions Initiative (URI) Cosmic Community Centre and Dr. Alexander Mar Thoma Centre for Dialogue, Kottarakara, Kerala, India, jointly organized the 7 th International Intertextuality Conference at Students Christian Center, Bangkok Thailand from September 1-3, 2017. 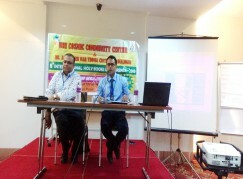 Mr. Mohammad Jahangir Alam, a promising Cao Dai research fellow and Associate Professor at the Department of World Religions and Culture of the University of Dhaka was invited to attend the conference and to present a paper titled “ A Critical Analysis of Creation Theory: Cao Dai Perspective ”.